Now as some of you know I am an exhibiting artist at the Rowayton Arts Center. 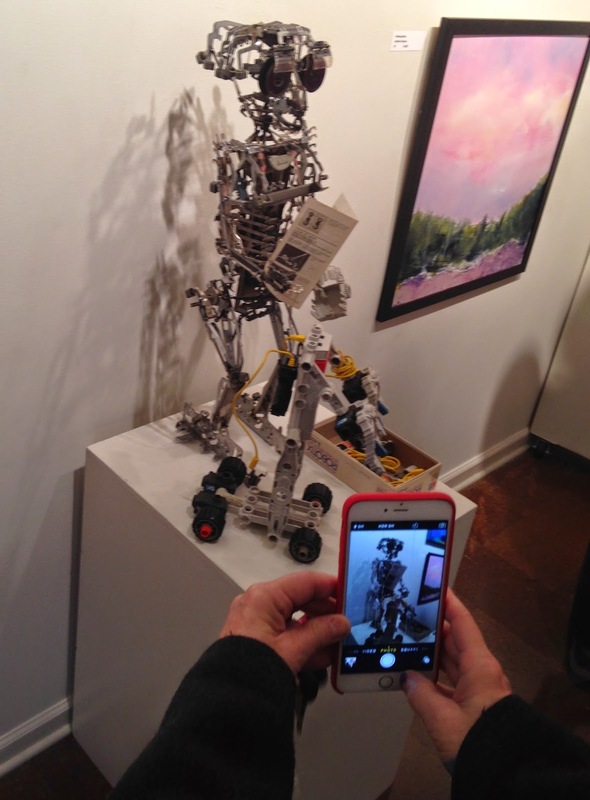 This means I spend a number of show openings attempting to take a picture of someone taking a picture of one of my works - like No Words - a sculpture made from my late grandfather’s Underwood typewriter. Or at a more recent show, when I took a picture of someone taking a picture of a newer work, Making a Friend. Don't laugh. I'm sure Picasso would have done the same thing if the iPhone 5 was around back then. But anyway: I also have to thank the Rowayton Arts Center for rescuing me from the one sheet workbench slump I was in since last year. Yes, I am still proud that I transported an entire 4 X 8 sheet of 3/4” plywood on a homemade cargo bike to build this workstation. Unfortunately I found that I didn’t like what I ended up building. Whenever I’d move it around, the vibration from the wheels on the concrete floor would shake the tools loudly and knock some of them off. It’s disappointing because this would have been perfect…if I built it for apartment living. I also realized the plastic cabinet in the middle was too low for me to see the contents and I’d frequently bring my tools when I knew I’d be fixing bikes in other places - such as the big Bike Rodeo in the small town of Red Hook, New York. Here’s where the Rowayton Arts Center fits in: every year they hold an ‘Arts & Ends’ tag sale where they sell a lot of (wait for it) art and art supplies. Even if you are not an artist, you should go because you may see something that inspires. 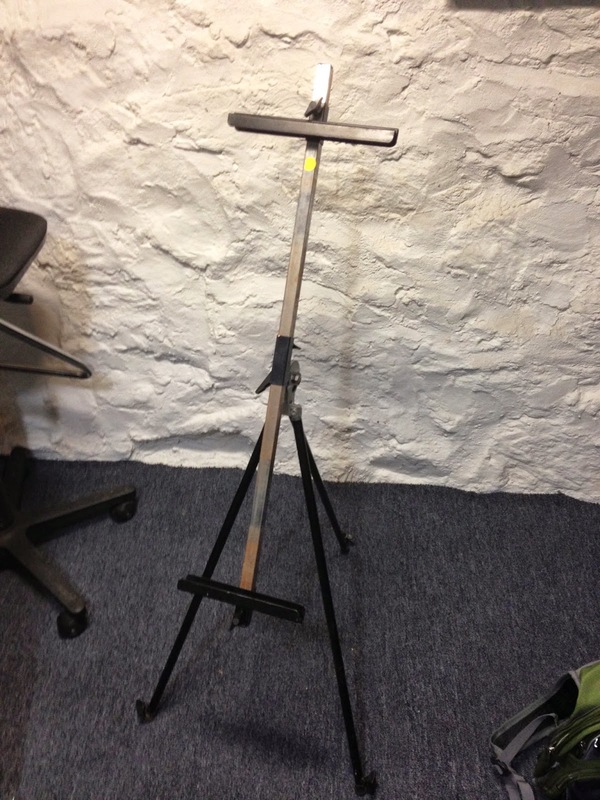 When I went to the sale early in the morning, I was inspired by (and paid $15 for) this metal easel. I don’t paint. I smear colored chemicals as evenly as I can on walls and, when dry, my wife can hang one of her paintings. So I had no use for this easel for ordinary, easelly purposes. 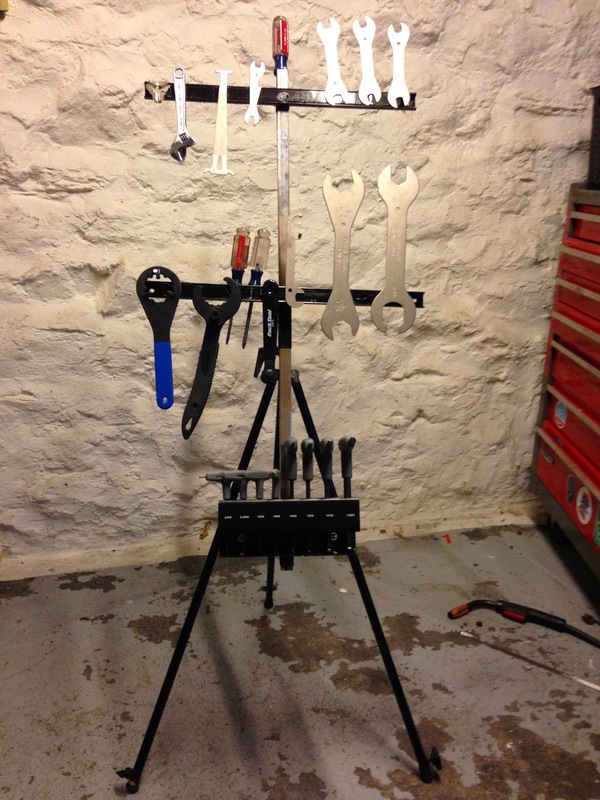 What I did want is to make a cool portable bike tool workstand. 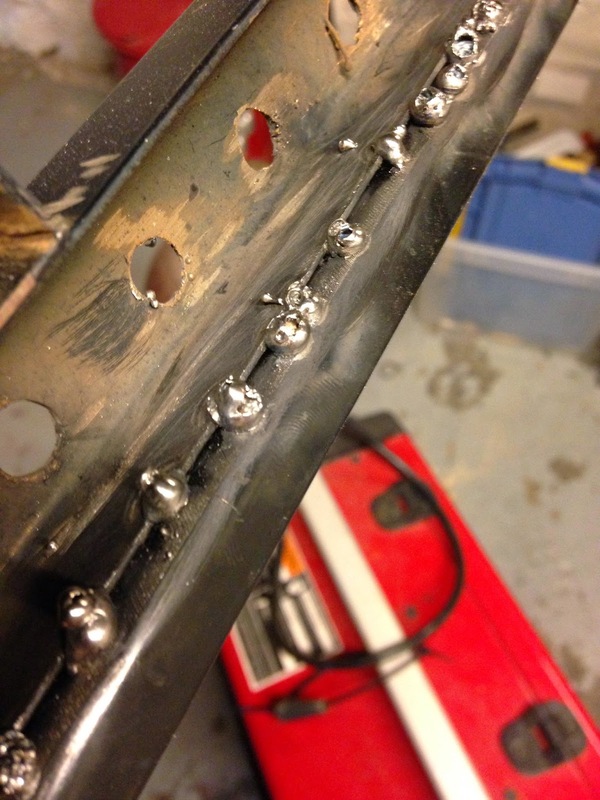 Tool boards are okay but as I had learned throughout the year they weren’t meant to be put into motion, so I decided to try my luck with magnetic tool strips bought from Harbor Freight Tools in New Haven. The piece on the left of this photo once held a canvas but the metal part where you can twist a screw to keep it secure to the frame has been separated via reciprocating saw. I reasoned that if I bolted my hex key holder to the piece on the left and put it in the easel frame first, the little stopper on the bottom would keep it from falling to the floor. Next I welded one of the tool holders to the canvas holder I did not saw in half. I also drilled a couple of holes in the canvas holder thinking I could put screwdrivers in. 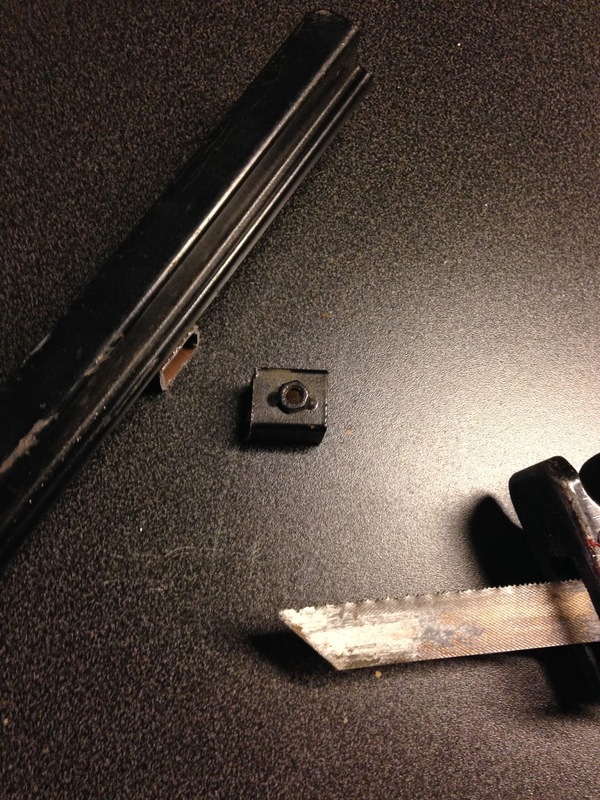 The small piece (with the hole for the thumb screw) leftover from the first cut was welded in the center of the other magnetic tool holder. When I put it in place, it seemed a bit weedy but it held. After a few minutes of taking tools off of the one sheet workbench, I had this. And it’s working quite well. 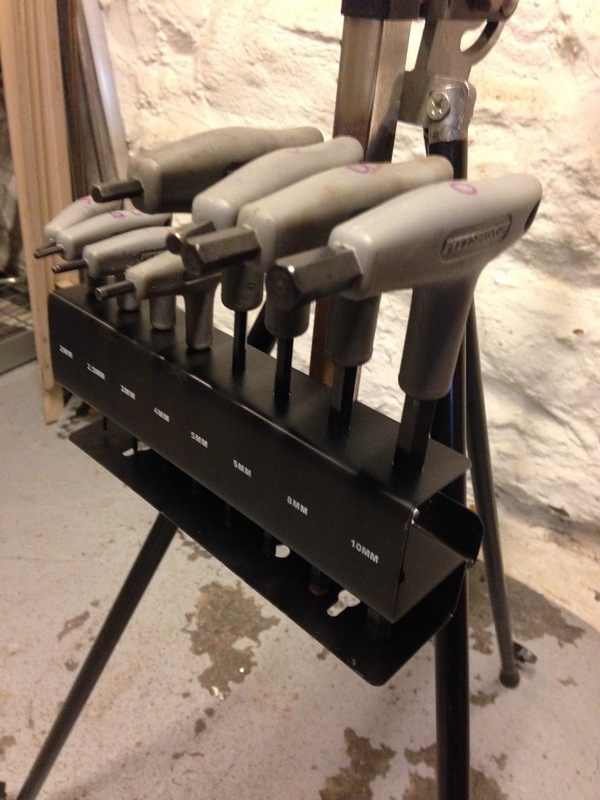 Tools are easy to see and reach and the magnet slaps them into place without the whole thing collapsing. 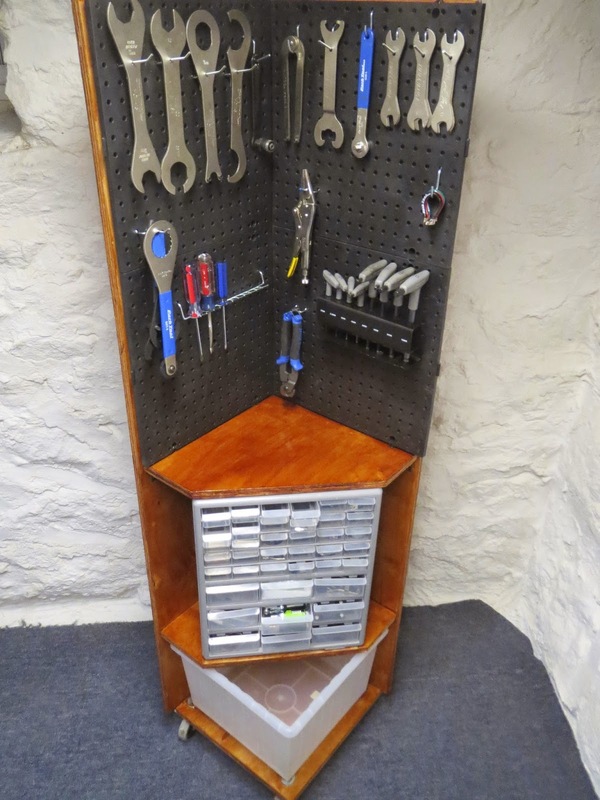 I can’t put every single tool on the board (I couldn’t do that with the one sheet workbench anyway) but this holds all of my frequently used tools, some of my seldom-used tools, and even the Park Tool tools I’ve bought but don’t fully understand what they are for. So I thank the Rowayton Arts Center for the Arts & Ends tag sale and I recommend that you follow the Rowayton Arts Center on Facebook and Twitter to make sure you’re in the loop the next time one of these tag sales takes place. In the meantime I recommend you visit the Rowayton Arts Center's 20th Holiday Gift Show which is going on right now through Christmas Eve (but closed Thanksgiving). They have a lot of original works for sale if you’re looking for a gift for that special someone - whether that special someone is a cyclist or not. As you probably guessed, some of my works are there but please don’t let that stop you. Thanks for reading and thanks for riding.